Think of vanpools as very large carpools. A vanpool is a group of 6 to 15 people who regularly travel together to work 30 miles or more (roundtrip) in a comfortable van at least 13 days out of the month. The van may be privately owned or leased. Typically, riders pay a monthly fare and maintenance fee, while drivers ride at a discounted rate in exchange for driving and maintaining the van. Employers sometimes offer subsidies covering some or all vanpool costs. 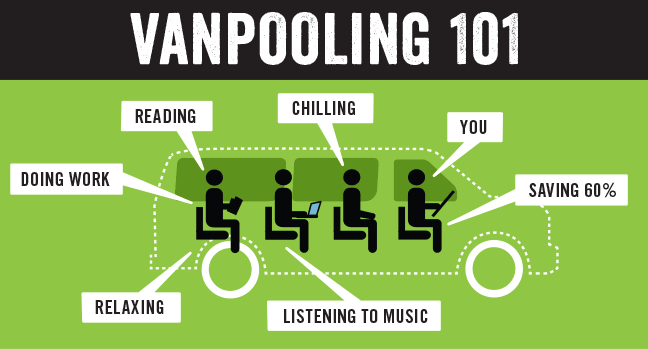 How do I start or join a vanpool? Set your start date and start moving! You can find potential route and schedule matches using the 511 RideMatch System or by calling Cruz511 at 831-429-POOL to explore starting a new vanpool. Economical. Shared expenses between vanpool riders. In a typical vanpool, 6 to 15 commuters ride together. Eco-friendly. Fewer cars on the road equates to less pollution. Comfort. Relax, read, sleep, or work while riding in roomy vans. Tax Savings. Federal tax laws allow you to pay vanpool fares from pre-tax dollars. Where do I meet my vanpool to get to work? Each vanpool sets its own route and schedule based on the needs of its members. Depending on the residence of each passenger, vanpools may have several pick-up points or one pick-up location. Your group also decides convenient drop-off points near your worksite. In many cases, vanpoolers meet their rides at Park & Ride lots — safe locations where they can leave their vehicles during the workday. The driver is a commuter who volunteers to drive the vanpool daily, often in exchange for a discounted commute. Vanpool drivers must possess a valid driver’s license and may need to meet additional requirements as determined by vanpool vendors. Where do I get the van? Most vans are owned or leased by individual commuters, while some are operated by employers. If you do not own a van, Enterprise Rideshare and CalVans have leasing plans available for vanpoolers. These leasing companies can also assist you with forming a vanpool. Do I have to make a long-term commitment to a vanpool? In most cases, the driver(s) and riders make a month-to-month commitment. You may leave the vanpool by giving the driver/coordinator the requested amount of notice at any time (usually 30 days). AMBAG – Offers a vanpool subsidy program in our region including Santa Cruz County. Eligible new vanpools may receive up to $350/month for up to one year.